We're back followers after Sprinter Scare obliged with one of the easiest wins you'll see at the Festival to get you & us off to a great start before Zarkandar just wasn't fit enough on the day but the horse we said to back in a forecast with him, Rock On Ruby, ended up winning the Champion Hurdle. We're looking for more winners this Wednesday & one of us will be up at the track (hoping that Sizing Europe gets beat thanks to some lay bets on Betfair), you can follow us on Twitter @LikeBuyingMoney by clicking the follow button above. The big race on the 2nd day of the Festival is the Queen Mother Champion Chase & this year we get to see the last two winners of the race line up with strong favourite Sizing Europe looking to bat away old rival Big Zeb & the rest of the opposition in a field of 8. The last two winners probably don't have an awful lot between them although Sizing Europe gave Big Zeb a beating last time they met in a three runner race at Punchestown but that was on some very testing ground & Colm Murphy was adamant that wouldn't have suited his charge at all & you only have to go back to May 2011 where Big Zeb turned the tables around from Cheltenham when they were on pretty quick ground. Since the start of 2010 Sizing Europe has won 5 of 11 races & has lost 2 of 5 of his races since jis win in this last year & taking all of that together it just meaans that he doesn't look the 'good thing' that some people make him & is certainly opposable at odds on. Both the previous two champs are also getting on a bit with Big Zeb now 11 & Sizing Europe 10, in the past 12 runnings only the truly great Moscow Flyer has won the race whilst in double digits of age & neither of these would claim to be at the Flyer's level s we think taking them both on with a younger model would be prudent. Kauto Star's half brother Kauto Stone is the baby of the bunch here & had a promising run when 2nd to the favourite here in the Tingle Creek just before Christmas but dissappointed badly behind Riverside Theatre at Ascot & may end up finding 2m 4f is his distance in the future. We're fans of Finian's Rainbow & he's been beaten just twice since going chasing coming 2nd in the Arkle last year & then getting outstayed by Somersby at Ascot both in Grade Ones against top opposition, Arkle winners have an awesome record in this race but Captain Chris doesn't go so Finian's Rainbow is as close as we'll get this year. He has an awful lot of class about him but Barry Geraghty may need to be at his best as we're unsure a battle up the hill will totally suit but if he can deliver Finian's Rainbow late, odds of 9/2 could be made to look silly. At fancy odds of 25/1 we also have to advise an each way bet on Realt Dubh, Paul Nolan's horse finished 3rd in last year's Arkle & was right at the top of the novice chaser tree, he's not run since & that counts against him but is the one capable of springing a surprise if any are. In the 2nd race of the day the Neptune Investment Novices Hurdle we think that new trainer John Ferguson can round off his incredible 1st year with a great run from Cotton Mill. Ferguson was Sheik Mohammed's bloodstock agent & he's used his connections to form an incredibly strong string of horses & at the time of writing this has had 22 winners from 61 runners this season for a strike rate of over 36% & over half finishing in the first three. 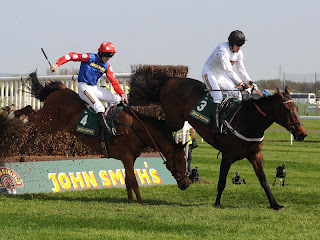 Cotton Mill is unbeaten over hurdles & was always likely to be decent as he achieved a rating of 95 on the flat back in in 2010 & has been campaigned for this race with his wins coming over 2m 4f twice & then the race distance of 2m 5f at Warwick in a Grade Two. The favourite for the race is Nicky Henderson's Simonsig but the odds available look a little too short & we'd be keener on the chances of Paul Nolan's Monksland, another with 3 runs over hurdles & a Grade Two under its belt. At the odds available though Cotton Mill has to be the selection with an each way bet at 16/1. For our final selection of the day we don't plan on being remotely original as we go with Grands Crus to win the RSA Chase at odds of 6/4 & we think he'll do it easily to show why a run in the Gold Cup was so strongly considered. 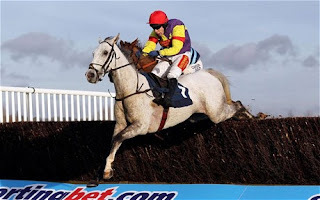 The 2nd favourite is Bob's Worth but Grands Crus had that rival back in 3rd on Boxing Day when he won the Feltham oozing class all the way, jumping excellently to show what a good decision it was to go chasing this year. Chasing was apparently always the plan but it was never an option to stay hurdling whilst Big Bucks cleaned up the division although that great champion was the only better stayer than our selection here. 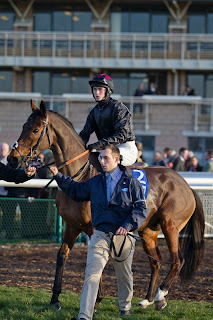 Join Together doesn't deserve to be as short a price as 6/1 on form & seems to only be that price thanks to connections with Paul Nicholls training & Ruby Walsh riding & we think the biggest danger comes from First Lieutenant as he has Cheltenham form thanks to winning last year's Neptune Investement Novices Hurdle. First Lieutenant has been slightly disappointing this season though & although we know he has class it probably isn't enough to beat Grands Crus at this or any stage, David Pipe's horse can show himself to be a fully deserving favourite to come up the hill in front, casting his rivals aside as they try to make their challenges.